Packing : We have carved out a reputed position in manufacturing, wholesaling, trading, retailing and supplying high quality Peg-Grafeel Injection Used to prevent neutropenia due to chemotherapy, the offered medicines are tested from our end in order to deliver a quality assured range from our end. 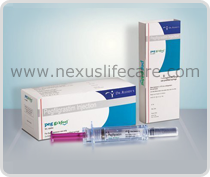 Peg-Grafeel Injection are formulated with the mixture of ingredients as per the set standards of medical sector. The medicines provided by us are taken only doctor's prescription.